EA's third person action game Plants vs Zombies: Garden Warfare is being pushed back from its original February 18 release date to February 25th. One has to assume the Future Cacti needed a bit more preparation, since they are from the future. Or something like that. On the plus side, with this delay comes a whole slew of juicy new co-op details for the four-player vs AI mode, Garden Ops. Crazy Dave, your metal pot helmeted friend from PvZ and PvZ 2 has supplied our allies with new herbage to fight the war on zombies. The Ice Pea is a support infantry capable of freezing the baddies in place while your leafy friends go whole hog on the stunned zombies. The Hot Rod Chomper switches things up by devouring zombies instead of the other way around. The Future Cactus fires energy quills at the enemies, and charges up to unleash a super bolt. The Mystic Sunflower plays a kind of "medic" role, doling out buffs and heals to your stalwart defenders. Check out the Dev Diary below. 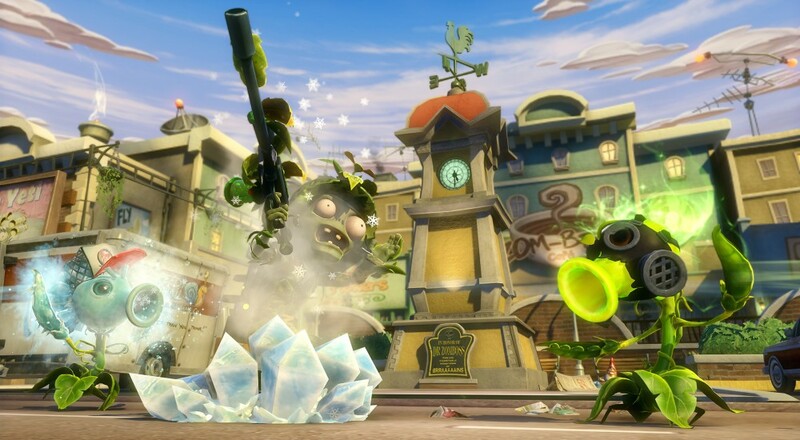 Plants Vs Zombies: Garden Warfare is set for a timed-exclusive Xbox launch which suggests a PS4 release may be on the horizon, though no word as to when Playstation fans can expect to blast Disco Dancin' zombies with peas. Xbox owners will receive a special boss level and Smart Glass integration to sweeten the pot.